CMS announced a joint statement with the AMA in early July regarding a compromise on how claims with 10 codes would be processed after 10/1/15. They published FAQs and responses for this announcement on 7/27. This announcement was advertised to be a settlement between these organizations regarding the efforts of the AMA to delay the implementation of ICD10 and the insistence of CMS that this deadline was final. Initially, I was concerned about how this announcement might affect the adjudication of all Medicare claims and the potential modifications to Medicare contractor systems we had already tested with our applications over the last several months. As it turns out, these changes to CMS policy are largely cosmetic and will have no impact on the processing of most claims. Additionally, although this policy is promoted as a relaxation of the implementation, it provides little relief to healthcare providers and their staff that are unprepared for the transition. 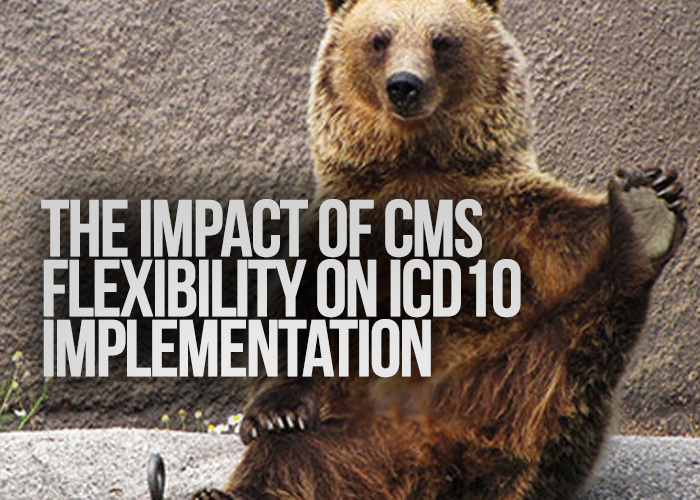 First, the 10/1/15 deadline for the migration from ICD9 to ICD10 is firmly in place. Second, these policy changes only apply to fee-for-service claims, normally submitted by physicians for their services. Although these claims require valid ICD10 diagnosis codes representing the current condition of the patients, the codes don’t currently affect the payments received for these services, unlike hospital inpatient claims. ICD10 diagnosis codes are more detailed than the current ICD9 set. Their detail can generally be measured by the number of characters in the code. They can be anywhere from three characters to seven characters in length. The three character codes are used to define the different categories or “families” of ICD10 codes. For these fee-for-service claims, CMS (Medicare) will accept (not deny on the basis of code accuracy) any ICD10 code on these claims as long as it is in the correct family, meaning as long as it starts with the correct three characters. This policy to relax the requirement for accuracy of these codes is scheduled to last until 10/1/16. However, the code provided must still be a valid ICD10 code. This does not apply to some situations where specific ICD10 codes are required for coverage of specific services as defined in the National Coverage Determination (NCD) and Local Coverage Determination (LCD) policies. These current policies will be converted to require new codes when we transition from ICD9 to ICD10 and these new codes are more specific than their ICD9 counterparts. In these cases, the correct code must be used for the services to be covered. Furthermore, this compromise policy does not apply to Medicaid claims or claims that are Medicaid crossovers. Given all these exceptions and the fact that the deadline and previous coding accuracy requirements still apply to all other payer organizations, it is difficult see how these compromises will provide any actual relief to physicians and their staff if they still cannot process this information properly. It seems to me that this announcement is a purely political attempt of the AMA to bring some sort of victory to their members regarding their most recent attempts to delay ICD10 implementation and the willingness of CMS to throw them a bone. This announcement simply delays the accuracy of the information collected from these claim types and reduces the value of this information for future efforts to analyze this data, until accurate codes are required and provided. This is the purpose of the transition of from ICD9 to ICD10. This new code set will allow for a deeper understanding of how specific healthcare services impact patient outcomes based on the more detailed clinical definition of their condition provided through these codes, the services provided as charges on the claim, and the outcome data required through meaningful use. This data can be processed with new analytic tools to develop insights into the effectiveness of treatments and their cost/benefit. This process will allow us to make more intelligent decisions on the art and science of healthcare delivery in the future.